While there are many brands and types of welding sleeves on the market, not all welding sleeves will offer the features you need. Here are the top 3 on the market. By Gregory Sanders: This article has been updated to reflect the most accurate information regarding welding sleeves available for those who are interested in welding. The best 3 available have changed, and information has been added to assist individuals in finding the best sleeves for welding currently available on the market. The FAQ has also been updated. The one size fits all Mechanix sleeves feature a 100% Kevlar construction offering amazing heat resistance and weight just 3 ounces. They are coated in Fibreshield to resist fluids to ensure good heat resistance. The sleeves are machine washable and don't suffer from much shrinkage after the was. As an added benefits they are also cut resistant. Sleeves are thick and may not fit under all welding gloves. The Mechanix Wear Heat Sleeves are a good value and made of quality materials. Made from flame retardant 100% cotton Proban FR7A to protects against sudden flame exposure, molten splash and sparks. Elastic at both ends of the sleeve to ensure a snug fit but allow easy taking on or off. These 23" long sleeves allow for full arm protection and washable in your washing machine. While good on paper these sleeves are not designed for anyone doing heavy duty welding as they do not offer sufficient protection. The US Forge 23” Welder’s Sleeve is a good choice for the price. Well made and heat resistant and also lightweight. Just don't use them for anything heavy duty. Made from double layer Kevlar the Black Stallion BSX Sleeves offer some serious heat and cut protection at a decent cost. The form fitting constitutions mans one size fits all, while the thumb holes provide adequate protection for your hands. The thumb notch keeps sleeves from sliding off. Sleeves will lose elasticity when machine-washed. We definitely recommend hand washing. Cut resistance is also lacking. The BSX BX-KK-18T Kevlar Sleeves are all you need to provide protection from welding hazards. Welding is a dangerous hobby or profession. Welding joins pieces of metal together by the use of heat, pressure or both. Electric shock. Even though welding generally uses low voltage, there is still a danger of electric shock. Intense light. The intense light associated with arc welding and the ultraviolet rays can cause damage to the retina of the eye, while infrared radiation may damage the cornea and result in the formation of cataracts. Toxic Fumes. Welding smoke is a mixture of very fine particles which include chromium, nickel, arsenic, asbestos, manganese, silica, beryllium, cadmium, nitrogen oxide, phosgene, fluorine compounds, carbon monoxide, cobalt, copper, lead, ozone, selenium and zinc. These substances can be extremely toxic and can effective the vital organs functions of the body such as breathing, nerve system, heart and kidney functions. Heat, Sparks, Flames. The intense heat of welding and sparks can cause severe burns and heat stroke as well as eye injuries. . Flammable Gas. Pressurized Gas Cylinders can contain flammable gas. There are a wide variety of jackets, bibs, aprons, gloves and sleeves made specifically for welders. Welding jackets, bibs and aprons protect your neck, shoulders and chest as you weld. Welding sleeves protect your arms and can even be attached to your welding gloves. Whether you are working at home or in the shop, any exposed skin should be shielded when using a welding tool in order to protect yourself from heat, fire and burns. Your arms are particularly susceptible since they are so close to the welding torch or tool that sparks can easily land on forearms or upper arms. Some people wear a welding jacket that extends from the neckline to the waistline, while also providing sleeves for the welder’s arms. Welding jackets are expensive and can be very uncomfortable to wear over long periods of time as they are heavy and hold in heat. Unless you are a professional welder working in a commercial welding shop that requires welding jackets, welding sleeves are a more affordable option. Welding sleeves protect the welder’s arms from the armpit to the wrist and often can be connected to welding gloves. These provide adequate protection in low volume welding processes such as welding for home or DIY projects in your garage, farm, or small shop. Proper safety procedures and protective gear can help you avoid hazards so you can get the job done and weld safely. Since welders are constantly working with heat, torches, and hot molten metals, clothing made especially for welding protection should be worn. Welding clothing is intended to protect the welder from metal splatter and high heat. Choosing the correct welding clothing can save you from serious burns and UV exposure. Welding clothing should be constructed of heavier materials like denim or leather that won’t catch fire as quickly as a synthetic material would. Investing in a pair of good welding sleeves will keep you comfortable and protect you and your clothes from hot sparks as you weld, cut or grind. Welding sleeve fabric should be flame-resistant cotton, leather or Kevlar knit. The sleeves should have elastic at both ends to easily put them on and remove them. The elastic on the sleeves should not be too loose because you want to ensure a snug fit for protection. Welding sleeves are available in a wide variety of durable fabrics that usually offer degrees of abrasion and fire or heat resistance. Leather: Leather is created by tanning animal hide. It’s a very durable material and exhibits good thermal and burn resistance properties. The most common leather comes from cow and pig hide, though other options such as deer or elk are produced. Leathers dry considerably over time. Leather products are either top grain or split grain--a cutting/tanning method used to make the product less abrasive to skin. Cotton: Cotton naturally is very flammable, but becomes effective at fire resistance with chemical alteration. It has better flexibility than leather, but lower durability. Through mercerization in caustic soda, sateen is derived from cotton. It has a softer feel and a different thread technique but also offers flame resistance. Cotton is also regularly intermixed with nylon fibers. Denim: While not optimal for welding operations, denim is a thick, rugged material that will protect welders in operations that are low in volume and intensity. Kevlar knit: Kevlar is a lightweight, flame resistant material made to withstand high heat rated up to 700 degrees Fahrenheit. This fabric will not melt or drip and creates a comfortable form fit. Kevlar knit is also resistant against abrasion, cuts and punctures. Kevlar Welding sleeves should be tough enough to protect you from most hazards you will likely encounter in welding. They offer the added bonus of being cut and abrasion resistant. It’s important to provide protection for the whole body when welding, because it can be a dangerous profession. The hands and arms in particular, because they are close to the heat of the weld, have particular needs. There are various ways to protect the hands and arms from the dangers of welding. Welding jackets, gloves and sleeves all provide protection to arms and hands. Welding jackets protect chest and arms very well but can be heavy and hot to wear. While welding gloves provide excellent protection for the hands, they do not go high enough up to protect the arms. Welding sleeves provide protection for the entire arm and can fit under many welding gloves. Welders who use capes or bibs for welding rather than jackets should also consider welding sleeves to protect their arms. Welding sleeves offer protection from high heat but still offer a good range of movement. 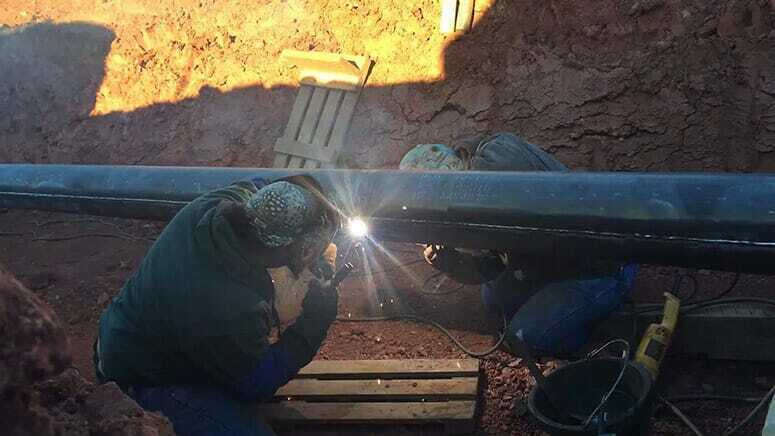 A good welding sleeve should be flame resistant, heat resistant, fit securely and offer flexibility.